Earlier this month, Malala Yousafzai celebrated her 18th birthday. You might be thinking, sure I knew that already! 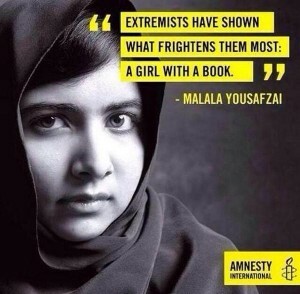 Or maybe you’re thinking… who the heck is Malala?! Malala Yousafzai is the girl who was shot in the head by the Taliban, as she set off home from school one day in 2012. She was just 15 years old. At that age she had already become an international activist & campaigner for children’s right to education. Writing an anonymous blog for the BBC, starring in a New York Times documentary, and appearing in schools & communities across Pakistan encouraging girls to go to school – defying Taliban Law in the region. The Taliban recognised the influence Malala & her father were having in Pakistan, and sought to brutally shut them up. 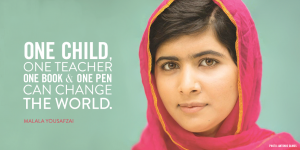 As she boarded her school bus one day, a man jumped on requesting Malala – and shot her 3 times. Fortunately the 3 bullets failed to do their job, and Malala was transferred to the UK for intensive rehabilitation. She has since grown to become an international inspiration. Last year she became the youngest person to be awarded the Nobel Prize, symbolically sharing the Peace Prize with Kailash Satyarthi, an activist from India. Her biography, I Am Malala, is available online and in all good bookstores. It is well worth a read! You would almost forget that this is a teenage girl, as she speaks with a wisdom of someone many times her age. She is quietly determined in everything that she does, with a vision that reaches far beyond the narrow minded chaos that has racked her country. She continues to tirelessly campaign for human rights, in the hope that one day all children across the globe can achieve 12 years of education. Her current campaign is titled #BooksNotBullets, encouraging global leaders & governments to spend less on war campaigns & divert more funds into education. You can get involved by taking a selfie with your favourite book & posting it to social media with the hashtag #BooksNotBullets. Follow us on Facebook to make sure you don’t miss the next post!